Change To Mammogram Guidelines Could Lead To Coverage Shift : Shots - Health News Under the Affordable Care Act, insurers must pay the full cost of preventive services blessed by an independent task force. 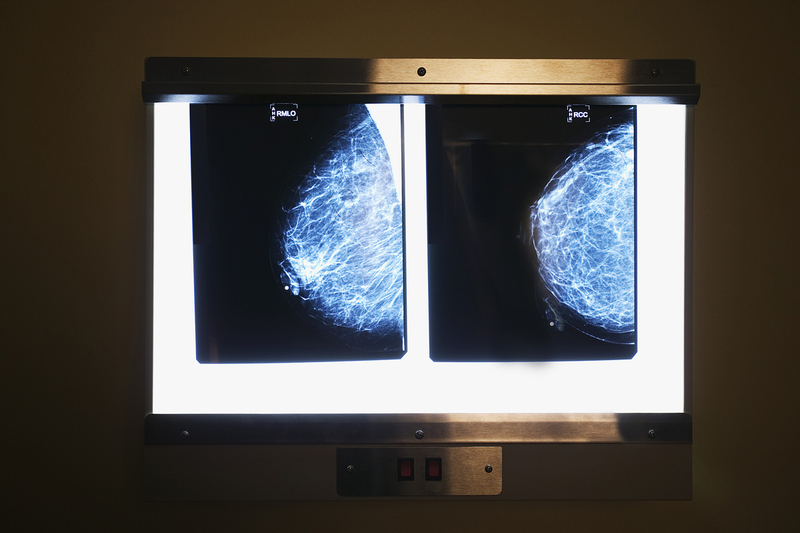 An update for mammography could affect the cost for women in their 40s. A change in mammography guidelines could affect their cost for many women. Millions of women could lose access to free mammograms under changes to breast cancer screening guidelines that influence insurers, the consulting firm Avalere estimates. The Avalere analysis is based on an update to breast cancer screening recommendations proposed by the U.S. Preventive Services Task Force, a group of medical experts whose work guides health care standards and policy. The public comment period on the proposal expires Monday. Seventeen million "is the absolutely worst-case scenario," says Caroline Pearson, senior vice president of Avalere and one of the study authors. She says the estimate assumes that every single insurer would refuse to pay for free annual mammograms for women ages 40 to 49, which isn't likely. Still, some insurers could reject the claims or require that women in that age range pay a share of the cost. Under the Affordable Care Act, insurers must cover the full cost of preventive services that are recommended by the task force on the basis of strong evidence. The task force grades the strength of the evidence it uses. If its recommendation is based on evidence that gets an A or B, then the federal health law requires insurers to go along. If, however, the evidence is weaker and gets a C or worse, then there's no mandate for free coverage. In 2009, the panel recommended that most women get a mammogram every other year, beginning at age 50. For women between 40 and 49, the panel said the evidence merited a C and that getting a mammogram should be an individual decision based on a woman's view of the benefits of cancer detection, weighed against the potential harms of false alarms and unnecessary treatments. Controversy over that 2009 recommendation caused Congress to intervene and led to an amendment to the Affordable Care Act that instructs insurers to follow a 2002 task force recommendation that gave a B rating to the evidence for screening women ages 40 to 49. Mammograms for women between 40 and 49 can be lifesaving. But the task force's initial recommendation suggests a disproportionate level of harm tied to screening in that age group. If the USPSTF proceeds with the recommendation, it would reset the standards for screening under the law. The task force proposal is at odds with guidelines from the American Cancer Society, for instance, which suggest women be screened every year, beginning at age 40. "It's such a volatile issue that insurers will likely decide it's not in their best interest [not to cover it]," says Dr. Otis Brawley, chief medical officer of the American Cancer Society. Brawley says insurance companies are competing for customers and will want to offer services they value, such as mammograms. He expects most insurers to continue paying for annual mammograms for women in their 40s. "They'll say we don't want to be the outlier that doesn't cover this," he says. He also says it's possible that Congress will intervene, as it did in 2009, and require insurers to pay for annual screenings. The connection between task force guidelines and insurance company coverage is often loose, says Dr. Kenny Lin, a professor of family medicine at Georgetown University and previously a medical officer for the U.S. Preventive Services Task Force program at Agency for Healthcare Research and Quality. "There are a lot of things that insurers cover that are not supported by USPSTF," Lin says, such as electrocardiograms in adults at low risk of heart disease and Pap test screening in women over 65. But Lin says, even if Congress doesn't intervene and some insurers refuse to pay for mammograms, that wouldn't necessarily be a bad thing. "For every woman in her 40s who has her life saved through breast cancer screening and treatment, 1,000 to 1,200 will receive a false positive [result indicating cancer when there is none], and 10 will get treatment for a cancer that was never going to harm them," he says. "If screening drops off, these harms would drop off correspondingly," he says.